Very beautifully located comfortable bungalow (on one level) on a very quiet dead-end street with a surface of 145 m2, a generous garage for 25 m2 and a fantastic sunny full free backyard on the South-West of 260 m2! and a front yard of 36 m2. A modern kitchen with all modern equipment. The whole House is equipped with a light oak parquet floor, an alarm system and the living room is equipped with a fireplace and air conditioning unit. A very beautiful home on a wonderful location! 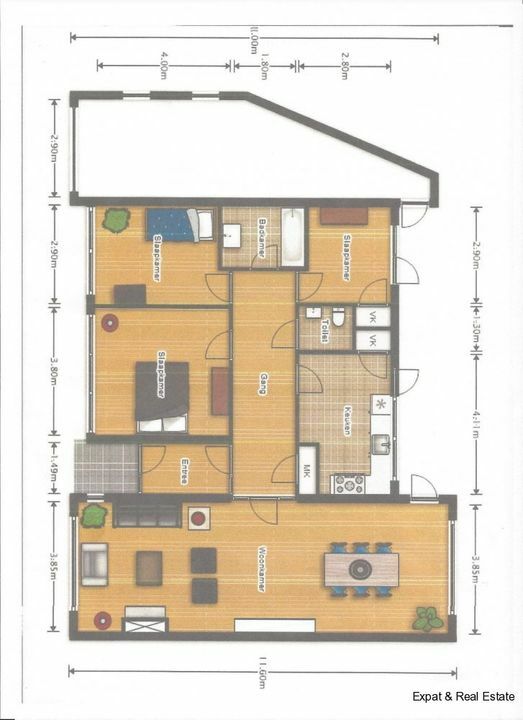 Layout: entrance and vestibule, spacious hallway with videophone for visitors.Large bright living room of 11 x 3,85 m. the kitchen measuring 4x3m with a U-shape. Completely renovated bathroom with bath, separate shower and sink, and underfloor heating. Two bedrooms in front of 4, 15 x 3.8 and 3.75 x 2.90. The third bedroom is at the back of 2,50 x 2.25 with a door to the garden. The huge garden of 18x15m with a wooden Garden House is very sunny and has and optimal privacy. The Garden features lighting and automatic garden watering. There is a large indoor garage and a carport with two parking spaces on site.